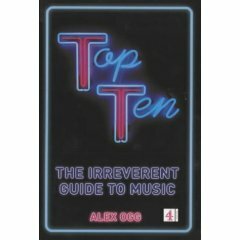 Top Ten: The Irreverent Guide to Music, Alex Ogg, Channel 4 Books, 2001, ISBN 978-0752219752, 256pp. I bought this from a used book store in England to read on the flight back. It’s what we in the States would call a “bathroom book,” i.e., a collection of short entries that can be read on an intermittent basis, depending on one’s available time and inclination, as opposed to a normal book that you give your full attention too. Typically I’ll read the latter on an airplane, but my attention span’s been a bit short recently, so I thought this would fill in the gaps when I wanted it to. Turns out that I read it pretty much straight through, instead, although I’m not sure my attention was totally focused on it at times. This is basically a book of lists that Ogg annotates with some facts and even more anecdotes. The mp3 revolution has totally revitalized my interest in music, both new and old, and this book helped me to fill in some gaps on my musical education of some of the more popular (at least in the U.K., as determined by the listeners of BBC Radio). It’s a bit like reading the transcripts of a VH1 show, like Living in the 80s, as the lists are grouped by music style (Boy Bands, Eighties Soul, Punk) or format (Duets, One-Hit Wonders). I was only familiar with 25 percent or so of what’s in the book. The other three-quarters was about bands I had never heard of or little details of obscure bands that I might have heard a song or two by. It’s probably better as a bathroom book, but it was interesting enough to lead me with a few notes about some music artists to look out for.